Making the most of the animation called performance capture Steven Spielberg creates a wonderful kid adventure with The Adventures of Tintin. The veritable rollercoaster ride of a film is even more spectacular in 3D. Targeted at lads of any age and for good family fun, rush to see the full feature film The Adventures of Tintin. The movie follows a young reporter Tintin (Jamie Bell) and his white furry dog Snowy as he begins to explore a mystery when he finds a piece of a map hidden in a ship model. The two meet up with Captain Haddock (Andy Serkis), a weather worn sea captain who takes a liking to them. The dastardly pirate Red Rackham (Daniel Craig) gets word that Tintin has a piece of the map needed to find the treasure of the shipwreck Unicorn and he sets out to steal the fragment from the boy. When Tintin and Haddock set sail on their incredible adventure, Rackham isn't too far behind. The intriguing mystery behind the map makes for great fun for youngsters who like adventure and thrills. Spielberg doesn't hold back a thing presenting a wild ride around the globe as Tintin sails, flies, rides and slides his way in and out of trouble. The fast paced movie leaves no time for antsy squirms or yawns, perfect for even the youngest family member. The voice cast ably lead by Jamie Bell (Nicholas Nickleby) as Tintin and Andy Serkis (Arthur Christmas) as Captain Haddock make the dazzling film work. Bell keeps his character full of excitement, inquisitive and caring, while the blustery Serkis provides Haddock's take charge demeanor. Adding the sinister voice of Red Rackham, Daniel Craig brings some mystery and suspense to the mostly lighthearted film. The Adventures of Tintin has been rated PG by the MPAA for adventure action violence, some drunkenness and brief smoking. The film is a compilation of original the graphic novels The Crab with the Golden Claws, The Secret of the Unicorn and Red Rackham's Treasure by Hergé. In order to achieve the enjoyment the film provides I thought it would be interesting to provide my readers with some facts on how performance capture is used in the making of The Adventures of Tintin. "The performance capture animation cinematography that was used in Tintin is a remarkable tool that uses groundbreaking techniques developed by Spielberg during the filming process. According to Paramount: Entirely unlike a traditional soundstage set, the performance capture process unfolds on what's called a Volume—a clean, white-and-grey stage featuring up to 100 cameras mounted in a grid on the ceiling, able to capture 360-degree coverage and render that data into three-dimensional space. On the Volume, all the actors (and also the wire-framed props and set dressings) wear reflective dots that are picked up by the camera in less than a 60th of a second, and interpreted into a 3D virtual moving picture. "In addition, another eight HD video cameras captured the raw performances as they unfolded. This was later used as reference for the animators to make sure every grimace, smile, shiver and nuance of emotion, from fear to friendship, came through as the actors' performances were morphed into digital creations. "Operating the virtual camera using a device slightly larger than a video game controller with a monitor attached, Spielberg was able to walk through the Volume, watch the actors' avatars interacting within the film's universe on the virtual camera's monitor, and compose the shots he wanted in real time. The actors, too, could see themselves in the movie's world on monitors positioned throughout the studio, allowing them instant feedback. 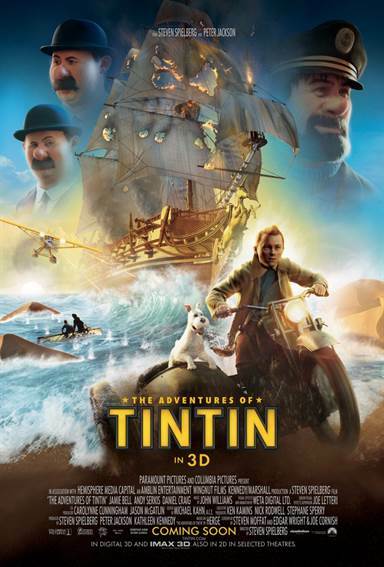 Download The Adventures of Tintin from the iTunes Store in Digial HD. For more information about The Adventures of Tintin visit the FlickDirect Movie Database.